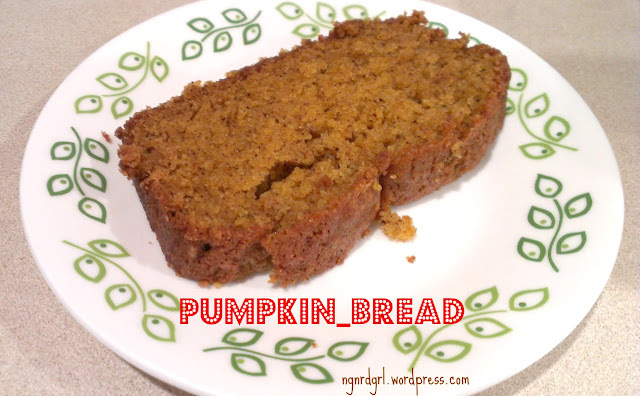 Today I am going to share with you my Pumpkin Bread recipe. Isn't it just mouth-watering? Him: "You should have made 5 loaves." Me: "Why? So you could have a loaf to yourself?" Growing up I did not like pumpkin pie. I'm still not that into it. I don't know why, I just am not that crazy for pumpkin pie. I wasn't much into anything pumpkin. 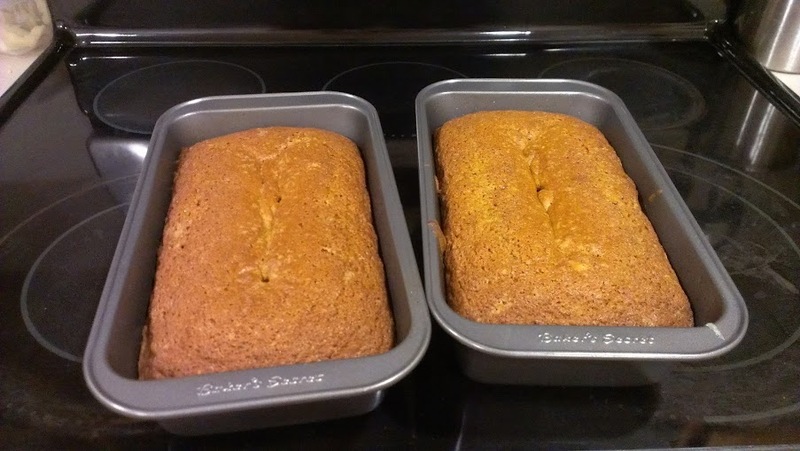 A coworker a couple of years ago brought in a couple of loaves of pumpkin bread. I LOVE bread. 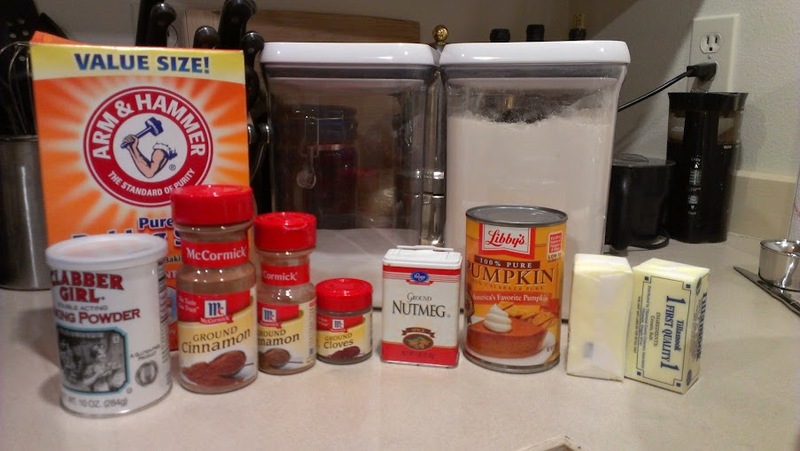 I also LOVE the spices that go into pumpkin recipes. I am a HUGE HUGE HUGE fan of cinnamon. I tried her pumpkin bread and fell in love. As soon as I got home, I looked up a recipe for myself. This is the recipe I found. I've given the short directions first so you can copy and paste to your digital cookbook (I use Evernote as my digital cookbook!) or printing. Scroll down for more detailed directions with pictures, my source and some alternate recipes. Add eggs; mix well. Set aside. Combine dry ingredients in small bowl; stir into creamed mixture a little at a time. Pour into two greased 9-in. x 5-in. x 3-in. loaf pans. Bake for 1 hour or until bread tests done. Pumpkin Bread Ingredients minus the eggs. 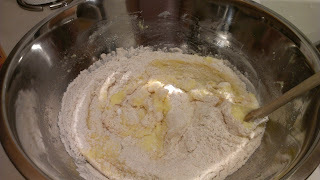 Cream butter and sugar in large mixing bowl. My butter was still a little cool, so it doesn't look super creamy in the picture. 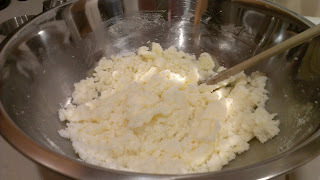 Mix in eggs and set aside. 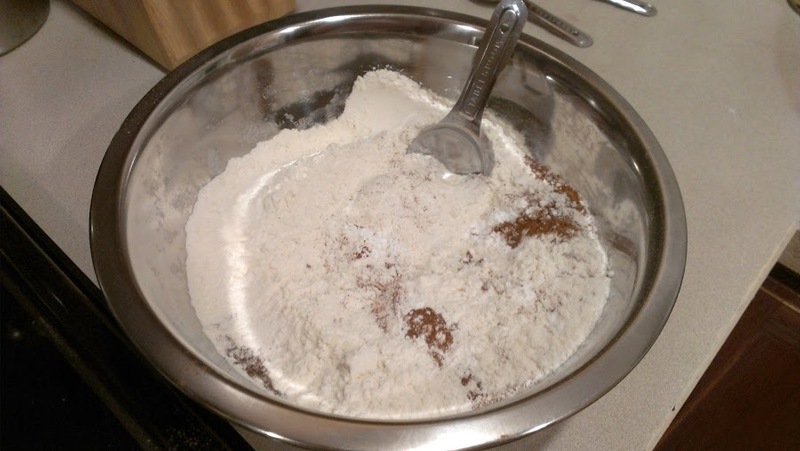 In a separate bowel, mix the dry ingredients. 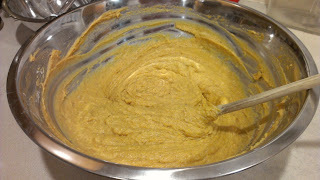 Add the dry ingredients into the creamed mixture a little at a time, stirring as you go. 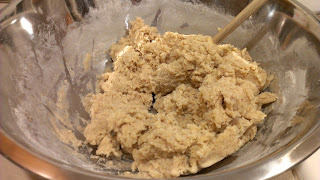 The texture should be like cookie dough once the dry ingredients are in. 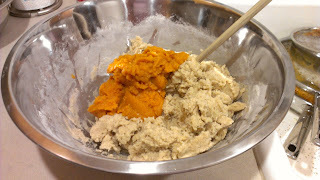 Add pumpkin... ...and mix until it is a uniform consistency. 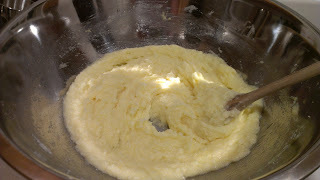 It should resemble cake batter now. Pour into two greased loaf pans and bake for 1 hour. You can test that it is done by sticking a toothpick in it. The toothpick should come out clean. I never have toothpicks in my house, so I end up using a chop stick, fork or knife. 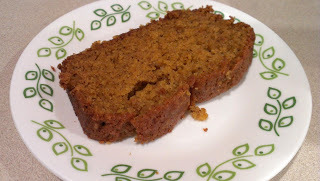 Enjoy yummy pumpkin bread! 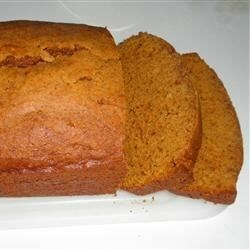 Source: I got this recipe from Pumpkin Bread 2 from allrecipe.com. However, it looks like that recipe may not be there anymore. 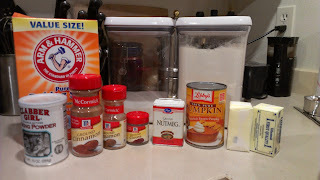 The link now takes me to Pumpkin Pie Bread, which has different ingredients then my original source. There are several different versions of pumpkin bread on this site. I can't remember why I chose this one over the others. I usually look at the ratings and popularity of a recipe. Then I take a look at the comments. The comments usually have great tips on how people improved the recipe. WOW! That looks so yummy! Thanks for linking up at my Pin Me Linky Party. I hope you come visit & link again. The party starts tomorrow at 8am CST. Oh yum, this looks WONDERFUL! I'll have to try it. :-) Stopping by from the Pinworthy Projects Party! 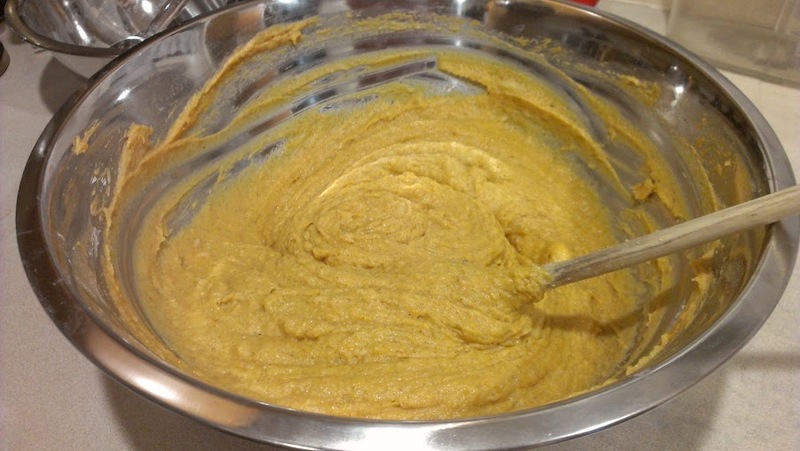 Your pumpkin bread looks so moist and delish! Great pics!! Thanks so much for sharing at our Winter Wonders and Holiday Happenings link party. Hope you have a fabulous weekend!